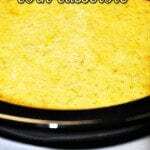 Great corn casserole recipe from Gooseberry Patch's Slow Cooking All Year 'Round. In a bowl, combine cream cheese, eggs and sugar. Mix in dry muffin mix and remaining ingredients. Pour into slow cooker and cook on high for 2-4 hours, checking occasionally and turning crock insert when necessary to cook evenly. This recipe is from Gooseberry Patch's Slow Cooking All Year 'Round. I highly recommend this cookbook. It is one of my favorites. I have recently been asked a lot about doubling this recipe for the holidays. If you need more than 8 servings, I would recommend making two batches in separate crocks vs. trying to double the recipe in the same slow cooker. I am concerned if you try to double it in the same crock pot that the middle may not get done. I would recommend playing it safe and making two batches instead of a double batch.